A new tech business which aids in transcribing audio files into text was crowned with Best Start-up Opportunity award at an event in Dublin City University (DCU) Alpha on Tuesday. Happy Scribe is a software aimed at journalists and researchers who wish to format hours of recorded interviews into text. André Bastié and Marc Assens, who both studied in DCU, established the programme earlier this year. The award was given by UStart, an accelerator programme under the Ryan Academy of the university. The initiative supports student entrepreneurs who are in the early stages of setting up their business. Bastié was undergoing a research project about social entrepreneurs in Ireland as part of his Masters in Electronic Commerce. 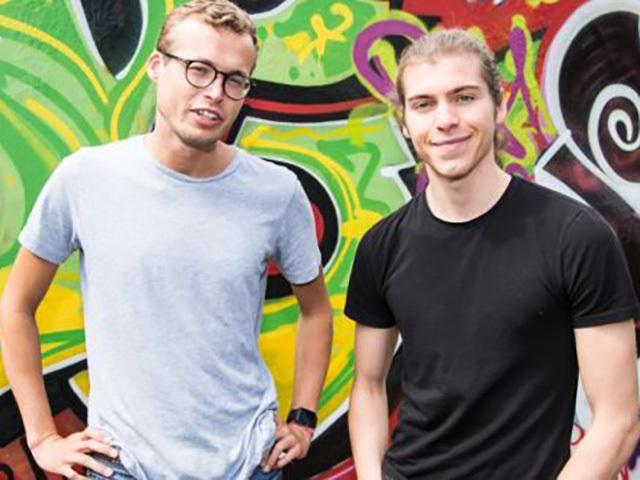 He came up with the concept of Happy Scribe alongside his flatmate Assens, an Erasmus student of Computer Science. Bastié conducted interviews as part of his studies, whereby one hour of an audio recording would require approximately four hours of transcribing. Both men initially developed the programme over the course of a weekend. They uploaded it to Research Gate, a social networking site for researchers. After a month of its launch online, the product was featured on Poynter.org, the website of the renowned American-based institute. “The article went viral, it received 40,000 views in less than a fortnight. Our servers crashed, nothing worked and we didn’t know why. The five users we might have known about suddenly increased to 80 people uploading files at the same time,” Bastié said. Currently, the programme has had over 4,000 users from over 50 countries and transcribed over 230,000 minutes of audio since its take-off in April 2017.